Jeff's Baking Blog – Cooking is like love. These are without a doubt some of the best, if not the best, rolls I have ever eaten. I may be biased, they are a family recipe and tradition, however, even the in-laws love them. My dog follows me around when I’m eating them, hoping for crumbs. Mark eats them despite his gluten intolerance. The stomach ache is worth it. A holiday around our house would not be a holiday without Grandma Coombs’ Rolls. These rolls make great sandwiches. I like to cut them in half, lightly butter them, and place them under the broiler for a few minutes to make them crispy and warm. Egg and cheese sandwiches make a great breakfast with these. Combine the warm water (105°-115°F) and Yeast. Set aside. You don’t want to get your water hotter than 115°F or you yeast will not work properly. Likewise, you don’t want your water cooler than 105° or your yeast won’t rise or will rise very slowly. Combine the butter and milk in saucepan over medium heat. Stir until the butter has melted and remove from heat and allow to cool to lukewarm, do not boil. This step is here because in the old days the milk was raw and needed to be cooked to kill off bacteria. You could skip it all together and just and the butter and milk, both at room temperature, to the mixture. I prefer the old method, I find the warm milk and butter helps with the raising process. You can use salted butter and any low fat or fat-free milk with good results (I prefer the full-flavored fat filled products). Stir until the butter has melted and remove from heat and allow to cool to lukewarm. It must cool to under 115°F or it will kill the yeast when added to the mixture later. Combine the cooled milk and butter mixture with sugar, salt and eggs in the bowl of a mixer using the dough hook on medium speed until fully combined. Add the yeast, mix until combined. Add the flour 1 cup at a time, the dough will be sticky. Growing up we always used All Purpose Flour, I however have switched to Bread Flour when available. Both work well. The dough will be sticky, don’t let that scare you. Place the dough in a lightly greased bowl and cover with plastic wrap. Let dough rise for 5 to 6 hours, or until doubled in size. Sprinkle with flour and punch down the dough. Using a third of the dough at a time roll out flat on a floured surface and lightly brush with melted butter. Using a pizza cutter cut into desired size. I cut mine into 16 pieces this time which produced nice medium sized rolls. For larger rolls cut into 8 pieces (larger rolls make great sandwich bread). Shape the rolls by rolling them up from the wide end to the pointed end and bend the ends slightly in towards the middle on one side, brush lightly with melted butter and let rise another 1-2 hours (until rolls risen about 1 1/2 times their original size) on a greased or parchment-lined baking sheet. Bake at 375°F (190°C) for 12-17 minutes. Combine the warm water (105°-115°F / 41°-46°C) and Yeast. Set aside. Combine the Butter and Milk in a saucepan over medium heat. Stir until the butter has melted and remove from heat and allow to cool to lukewarm. Combine the milk and butter mixture with sugar, salt and eggs in the bowl of a mixer using the dough hook on medium speed until fully combined. Add the flour 1 cup at a time, the dough will be sticky. Place the dough in a lightly greased bowl and cover with plastic wrap. Let dough rise for 5 to 6 hours, or until doubled in size. Punch down the dough, using a third of the dough at a time roll out flat on a floured surface, brush lightly with melted butter. Using a pizza cutter cut into desired size. Shape the rolls, brush the tops lightly with melted butter, and let rise another 1-2 hours (until rolls risen about 1 1/2 times their original size) on a greased or parchment-lined baking sheet. Caramel candy originated in America. It’s use dates to the seventeenth century when it was a hard candy. Around 1850, it was discovered that by adding milk and fat, rather than water, to the cooked sugar mixture, resulted in a chewy candy. This recipe makes excellent caramel candies. You can use dark or light brown sugar with good results. The hardest part of making them is waiting 24 hours before cutting them. You will want to wait though, they’re much easier to cut and handle after 24 hours. When making sugar based candy the very fist thing you should always do is calibrate your candy thermometer. Every degree counts when working with sugar, even just a couple degrees off can ruin the intended results. To calibrate simply bring a couple cups of water to a full boil and place the candy thermometer in the boiling water. Water boils at 212°, so if your thermometer is showing something different remember to adjust the desired temperate accordingly. Mine is too hot by about 7° this time. To adjust I subtract 7° from the final temperature I’m trying to reach. For the next 40 minutes you are going to be stirring constantly, make sure you have everything you need ready and a tolerance for repeated movements. Working with hot sugar is not a good activity for kids or pets, so remove them from the kitchen if possible. Melt butter in a large heavy bottomed saucepan. Add the brown sugar and salt, stirring until incorporated. Stirring until incorporated. Blend in light corn syrup and sweetened condensed milk. It may not completely be incorporated, once it heats up and the sugar starts to melt everything will come together, so don’t worry to much if a little of the melted butter is floating on the sides. Stir constantly over medium heat to 245°F on a candy thermometer. The color will get darker and the thickness will increase the closer it gets to 245°F. If you don’t reach 245°F the caramel will be softer but hard to work with and if you go over 245°F the caramel will be harder (possibly to hard to eat safely with dental work). Remove from heat and stir in vanilla extract. The extract is added at the end so it’s flavor is not cooked out, which would be the case with all alcohol based extracts. Pour into a greased pan, without scraping the bottom of sauce the pan. Cool for at least 24 hours (as hard as that might be). Cut into desired size and wrap in waxed paper. Caramels keep for weeks when wrapped in a airtight container. Melt butter in a large heavy bottomed saucepan. Add the brown sugar and salt, stirring until incorporated. Blend in light corn syrup and sweetened condensed milk. Stir constantly over medium heat to 245°F (118°C) on a candy thermometer. Pour into greased 9 inch square pan, without scraping the bottom of the sauce pan. Cool for at least 24 hours. Cut into desired size and wrap in waxed paper. I had an art teacher in college that changed every pronoun to a gender-neutral term. Craftsmanship became craftspersonship, I’m sure you get the picture. 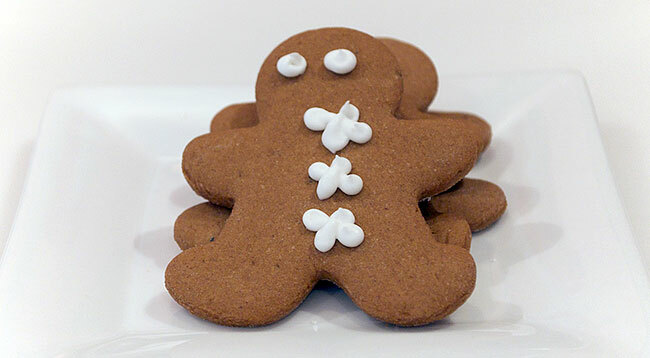 Gingerbread Men, Gingerbread People, whatever, I just call them cookies. You can go all out and put clothes and all sorts of decorations on the cookies. I prefer mine with minimal decoration and slightly undercooked, making them soft and chewy. If you’re using them for tree decorations you can leave out the spices and save some money. In a bowl, whisk together flour, baking soda, and baking powder; reserve. In a mixer fitted with the paddle attachment, cream the butter and sugar until light fluffy. Mix in spices and salt. If you are grinding your own spices be sure to use the finest setting possible for greater flavor. Mix in the eggs and then the molasses. Both the eggs and the molasses should be rum temperature, if they are not they will not incorporate correctly with the butter. Add the flour mixture in thirds on low speed until combined. The main reason to add in thirds at a low speed is to keep the flour from going all over your kitchen. If you have a mixer that has a top to stop the flour from going everywhere you can add it all in at once. Divide dough into thirds, wrap each part in plastic. Refrigerate for at least one hour. You can make the dough up to three days ahead of time and keep in the refrigerator until your ready to cut out your cookies. Place one of the divided dough sections on a lightly floured work surface. On a lightly floured work surface, roll dough 1/8-inch thick. If the dough is too cold it will crack around the edges, gently squeeze the cracks together and use the rolling pin over the dough to correct. Cut into shapes then transfer to a parchment-lined baking sheet. Refrigerate for 15 minutes. If you don’t refrigerate the cut out cookies they will spread and lose their shape while cooking. Bake for 9-13 minutes at 350°F, or until slightly brown around the edges. Cool cookies on wire racks. Decorate with royal icing. In a mixer fitted with the paddle attachment, cream the butter and sugar until light fluffy. Mix in spices and salt, then the eggs and molasses. Add the flour mixture in thirds on low speed until combined. Divide dough into thirds, wrapping each part in plastic. Refrigerate for at least one hour. On a lightly floured work surface, roll dough 1/8-inch thick. Cut into shapes then transfer to a parchment-lined baking sheet. Refrigerate for 15 minutes. Bake for 9-13 minutes at 350°F (177°C), or until slightly brown around the edges. Cool cookies on wire racks. Decorate with royal icing. These are a holiday classic around my house. Not only are they incredibly easy to make, they taste delicious. For a nice variation, you can use a pistachios, pecans or any other nut instead of the walnuts. 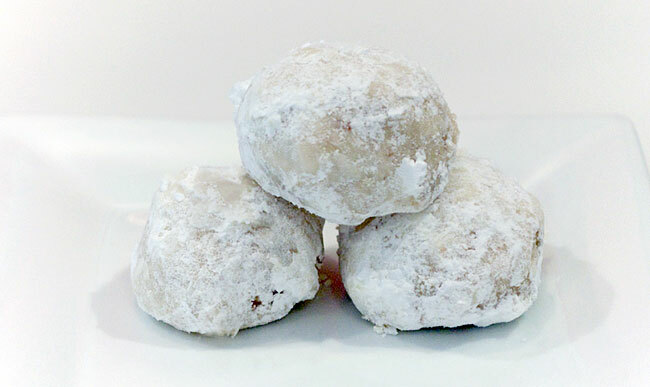 These cookies are also known as Mexican wedding cookies or butter balls. Using a mixing bowl with the paddle attachment cream butter and vanilla until smooth. Add the 1 1/2 ounces powdered sugar and flour into the butter mixture, at a low speed, until just combined. Mix in the chopped walnuts. Careful not to overwork the flour. The more you mix the flour the tougher your cookies will be. For the most tender results, run the mixer only until each ingredient, not including the butter and vanilla in the first step, are just combined. Using a cookie scoop or tablespoon roll dough into one inch balls, and place them two inches apart on a parchment-lined baking sheet. The cookies will not expand all that much, you can get up to 30 on a regular sized baking sheet. Bake for 10-12 minutes, until lightly browned, at 350°F in the preheated oven. When cool, roll in remaining powdered sugar. Roll in the sugar a second time. Using a mixer with a paddle attachment cream the butter and vanilla until smooth. Add the 1 1/2 ounces powdered sugar and flour into the butter mixture, at a low speed, until just combined. Mix in the chopped walnuts. Using a cookie scoop or tablespoon roll dough into one inch balls, and place them two inches apart on a parchment lined baking sheet. Bake for 10-12 minutes, until lightly browned, at 350°F (175°C) in the preheated oven. When cool, roll in remaining powdered sugar. Roll in the sugar a second time. 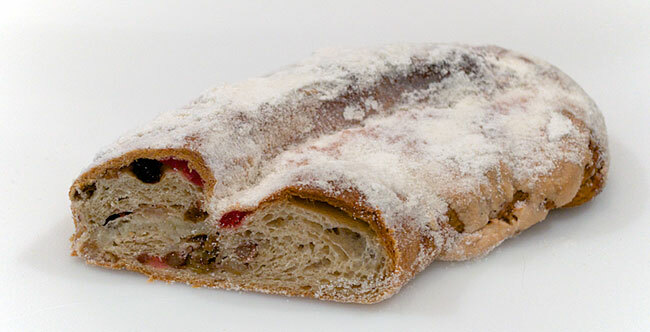 Don’t let the candied fruit and raisins scare you, this is no average Dresdener Stollen. The cardamom and almond paste filling set this tender and moist Christmas time bread apart form those breads most won’t touch. Mine was gone in less than one day. Note, the images are of the recipe doubled. The fruit and nut mixture preparation is not pictured, it should be done at least 24 hours in advance. Cut the cherries, candied orange peel, and pecans into raisin-sized pieces. Combine with the golden raisins and dark raisins. Marinate in the rum for 24 hours, stirring 4 or five times during the marinating time. If you do not cook with alcohol orange juice or cranberry juice can be substituted, either way, be sure to marinate them in some liquid or they will be too dry. To start the dough, dissolve the yeast in the warm milk (milk should be between 105°F and 115°F, if you get any hotter it will kill the yeast). In your mixing bowl using the dough hook combine the yeast, salt, honey, granulated sugar, eggs, cardamom, cinnamon, cloves, and allspice. If you still have some lumps of spices try breaking them up with a whisk. Mix until combined. Mix in half the flour on low speed. Add then the butter, followed by the remaining flour. Once the four is combined, mix on medium high for eight minutes. Cover and let rise in a warm place until doubled in volume (about 90 minutes). It was a cold day in San Diego when I made this, so I warmed the oven up to 200°F and turned it off, about 20 minutes after it served as a good proofing box. Be careful when using the oven to proof not to get it too warm or it will kill the yeast. I have an oven thermometer I keep in the oven to check the temperature when the oven is off. You want the temperature to be around 90°F. To make the vanilla sugar topping combine the sugar and vanilla extract in a small bowl and mix with a fork until well combined. Add the powdered sugar and using a fork mix until combined; reserve. You can also buy vanilla sugar at most grocery stores, however, it’s much cheaper to make it. Flatten the dough into a rectangle and press spread the fruit and nut mixture evenly over the surface. Enclose the fruit and nuts by folding the dough in half. Let rise, covered with plastic, until doubled in volume (about 90 minutes). Now for the almond filling. Placing the almonds in a high-speed food processor and process to a powder. Place the water and sugar in a saucepan and bring to a boil and remove from heat. This creates a simple syrup, which you can buy in the store for about 100 times its raw ingredients price if so inclined. Add the powdered sugar to the almonds in the food processor. Pulse until combined. With the machine running, gradually add the sugar water until a thick paste forms. Add about 1/4 an eggs white to the almond paste and combine until the mixture is about the consistency of buttercream but not too thin. You may need very little egg white depending on how recently your almonds have been blanched. You can buy Almond paste in the grocery store as well, it’s not cheap, add the egg white to the store bought to thin it out. Punch down the dough using your hand until flat and in the original rectangle shape. Form the dough into an oval loaf with tapered ends, keep the fruit and nut mixture inside (it will burn if not covered by the dough). Using the rolling pin flatten the loaf, keeping the same general shape. Press the rolling pin lengthwise in the center of the loaf to make a small indentation. Pipe the almond filling using a No. 9 tip into the indentation. Fold the dough almost in half lengthwise, leave the bottom part about 1/2 inch wider than the top. With the fold on the inside bend the loaf into slightly curved shape. Place on a sheet pan lined with parchment paper. Rise for about 45 minutes to an hour, until loaves are 1 1/2 times their original size. Stack an additional sheet pan under the loaf, so the bottom does not burn, bake at 375°F for about 1 hour or until baked through. Brush the loaves with melted butter right out of the oven. As soon as they are cool enough to tough, sprinkle with the sugar mixture and press down to ensure it is sticking. Allow to cool completely before serving. This should keep well, covered, for up to a week. Fruit and nut mixture: Cut the cherries, candied orange peel, and pecans into raisin-sized pieces. Combine with the golden raisins and dark raisins. Marinate in the rum for 24 hours, stirring 4 or five times during the marinating time. Dough: Dissolve the yeast in the warm milk (milk should be between 105°F and 115°F/40°C to 46°C). In your mixing bowl using the dough hook combine the yeast, salt, honey, granulated sugar, eggs, cardamom, cinnamon, cloves, and allspice. Mix until combined. Mix in half the flour, then the butter, followed by the remaining flour. Once the flour is combined, mix on medium high for eight minutes. Cover and let rise in a warm place until doubled in volume (about 90 minutes). Make the almond filling. While the dough is rising placing the almonds in a high-speed food processor and process to a powder. Place the water and sugar in a saucepan and bring to a boil and remove from heat. Add the powdered sugar to the almonds in the food processor. Pulse until combined. With the machine running, gradually add the sugar water until a thick paste forms. Add about 1/4 an eggs white to the almond paste and combine until the mixture is about the consistency of buttercream but not too thin. To make the vanilla sugar topping combine the sugar and vanilla extract in a small bowl and mix with a fork until combined. Add the powdered sugar and using a fork mix until combined; reserve. Punch down the dough using your hand until flat and in the original rectangle shape. Form the dough into an oval loaf, keep the fruit and nut mixture inside (it will burn if not covered by the dough). Using the rolling pin flatten the loaf, keeping the same general shape. Press the rolling pin lengthwise in the center of the loaf to make a small indentation. Pipe the almond filling using a No. 9 (18-mm) tip into the indentation. Fold the dough almost in half lengthwise, leave the bottom part about 1/2 inch (1.2 cm) wider than the top. With the fold on the inside bend the loaf into slightly curved shape. Place on a sheet pan lined with parchment paper. Rise for about 45 minutes to an hour, until loaves are 1 1/2 times their original size. Stack an additional sheet pan under the loaf, so the bottom does not burn, bake at 375°F (190°C) for about 1 hour or until baked through. Brush the loaves with melted butter right out of the oven. As soon as they are cool enough to tough, sprinkle with the sugar mixture and press down to ensure it is sticking. Allow to cool completely before serving. 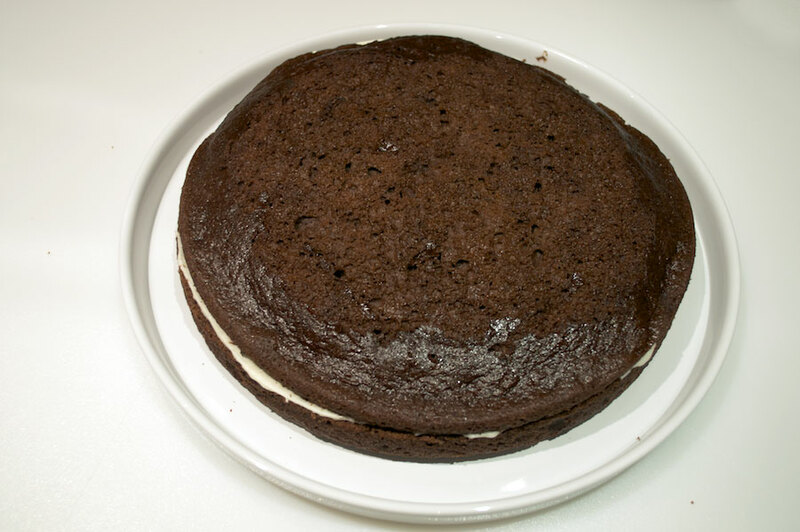 This cake resembles a traditional chocolate cake that is airy, moist and sweet, only without gluten. It’s an excellent base for any chocolate cake. The best part is how easy it is to make. It only takes about 10 minutes to throw it all together. The hardest part is making sure you have the ingredients, which any Wholefoods or alternative market should have in stock. Whisk together the dry ingredients. Add the wet ingredients and beat the batter until all the ingredients are incorporated and the batter is smooth. Line a 9-inch cake pan and fill with the batter. Bake for about 25 minutes, or until a toothpick inserted in the center comes out clean. Allow cake to cool completely in the pan before removing it from pan. 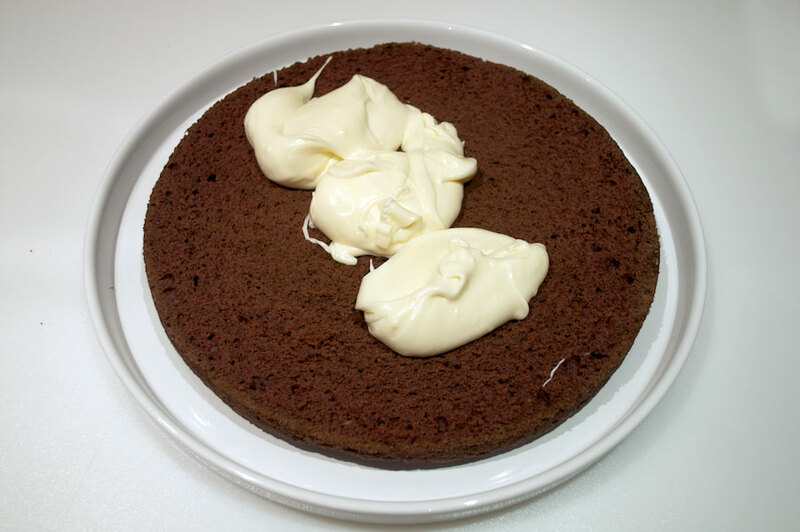 Aat this point you have a great gluten-free Chocolate cake sponge that can be used with any frostings or decorations you wish. Using a serrated knife slice the cake sponge in half horizontally. Place enough cream cheese frosting on the top of the bottom slice to create about a third of an inch thickness and spread the filling out evenly. Place the top slice on the top of the cream cheese filling. 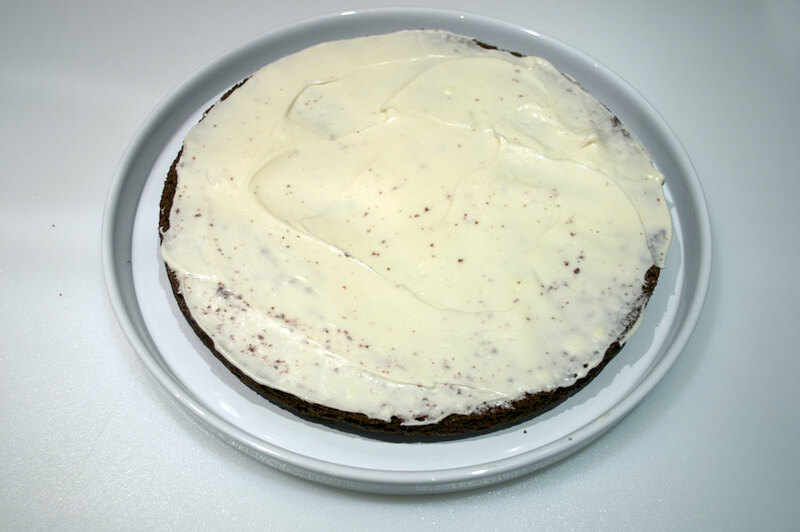 Create a crumb coat by covering the top and sides of the cake with some frosting. Place the cake in the fridge long enough to for the frosting to harden slightly. Cover the crumb coat with the remaining frosting. The process of a crumb coat ensures none of the dark cake sponge crumbs are visible when the final layer of frosting is applied. 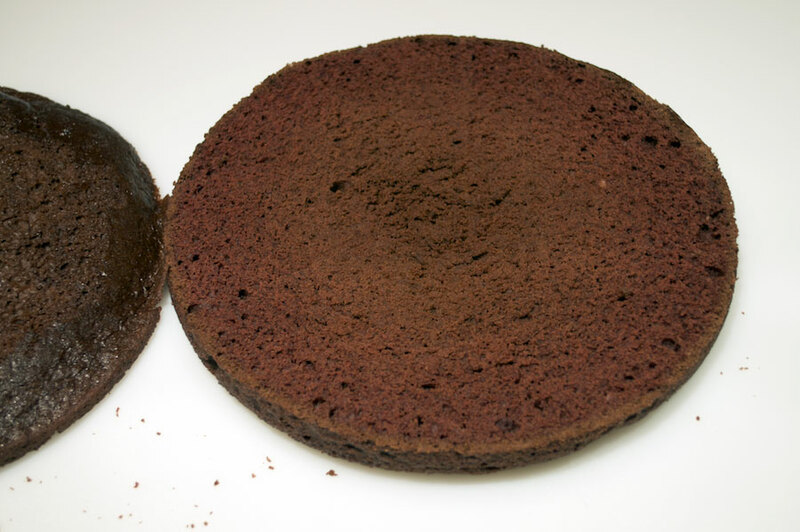 Cut a circle on a piece of parchment paper that is slightly smaller than the cake round and set over the cake. Gently sift cocoa powder over the top. 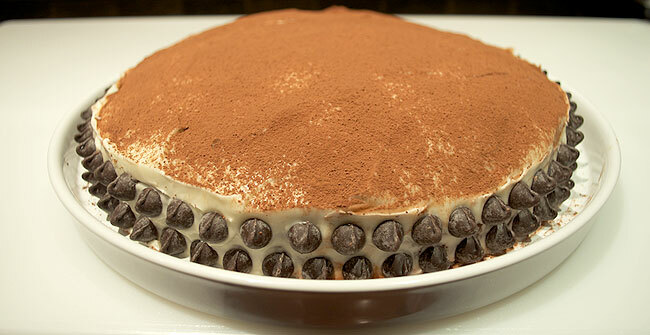 Carefully remove the paper and decorate the sides of the cake with chocolate chips. Line a 9 inch (22.5 cm) cake pan and fill with the batter. Bake for about 25 minutes, or until a toothpick inserted in the center comes out clean. Allow cake to cool completely in the pan before removing it from pan. Cover the top and sides of the cake with some of the frosting. Place the cake in the fridge long enough to for the frosting to harden slightly. Cover the cake with the remaining frosting. For Halloween this year we handed out candy from our decorated driveway. In an effort to be festive we invited friends and neighbors to stop by and enjoy the festivities. I made these cupcakes and some sugar cookies to hand out to neighbors. Usually, the kids won’t take unwrapped food – however, that was not the case this year. By the end of the night all the baked goods and the majority of the candy was gone. We need two bowls for this recipe, one medium sized and one large. Using the medium sized bowl, whisk together the flour, baking soda, baking powder, salt, cinnamon, ginger, nutmeg, and allspice until smooth. Reserve for later. Whisk together in the large bowl the brown sugar, granulated sugar, melted and cooled butter, and the eggs. Add the dry ingredients to the wet ingredients in the large bowl, whisk until smooth. Whisk in the pumpkin puree. Divide batter evenly among cupcake liners in a muffin tin, filling each liner no more than two thirds full. I used a cookie scoop and fill each liner with three scoops, about 4 1/2 tablespoons. Bake at 350° until a toothpick inserted in the center comes out clean, 25-30 minutes. About five minutes after removing the tray from the oven transfer to a cooling rack. 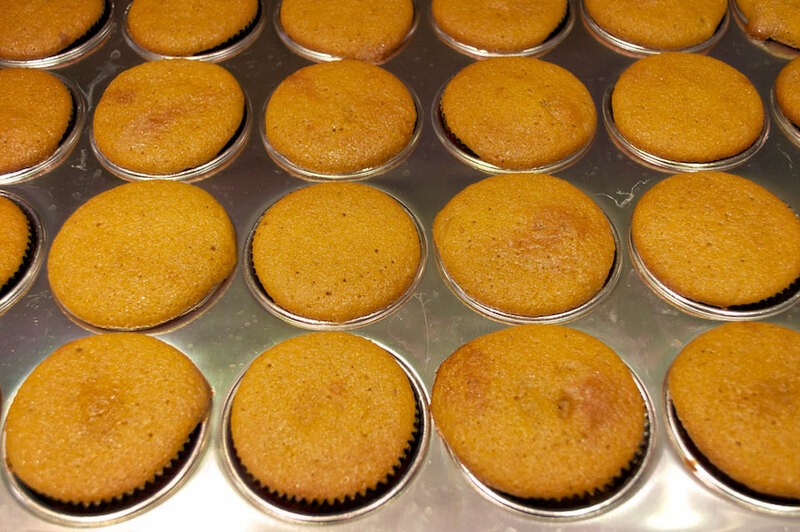 The cupcakes are easier to remove from the muffin tin when they are cooled slightly. For the frosting use a mixer fitted with a paddle attachment and beat the cream cheese, butter, and maple syrup on medium until fully combined. Beat in the confectioner’s sugar on low until smooth. Decorate as desired. I went simple opting to just top the cupcakes with the frosting. It was dark so no one would notice any decorations, I was running out of time, or being lazy, take your pick! Either way, they tasted great. Preheat oven to 350°F (177°C). Using a medium bowl, whisk together the flour, baking soda, baking powder, salt, cinnamon, ginger, nutmeg, and allspice until smooth; reserve. Whisk together in a large bowl the brown sugar, granulated sugar, melted and cooled butter, and the eggs. Add the dry ingredients, whisk until smooth. Whisk in the pumpkin puree. Divide batter evenly among cupcake liners in a muffin tin, filling each liner no more than two thirds full. Bake until a toothpick inserted in the center comes out clean, 25-30 minutes. About five minutes after removing the tray from the oven transfer to a cooling rack. For the frosting use a mixer fitted with a paddle attachment and beat the cream cheese, butter, and maple syrup on medium until fully combined. Beat in the confectioners’ sugar on low until smooth. Decorate as desired. Around this time of year fresh pumpkins start to disappear from the grocery shelve stores. If you are like me, you prefer fresh pumpkin rather than canned. In an effort to avoid the canned pumpkin I puree several fresh sweet pumpkins and freeze them for later use. You’ll need to use an edible sweet pumpkin for pies, cakes, and breads. The pumpkins Americans carve for Halloween and the smaller decorative pumpkins are not a good choice for eating. When picking out pumpkins to puree select ones that are about the same weight and size. When baking the pumpkin if one has a thicker flesh it will take longer to finish. 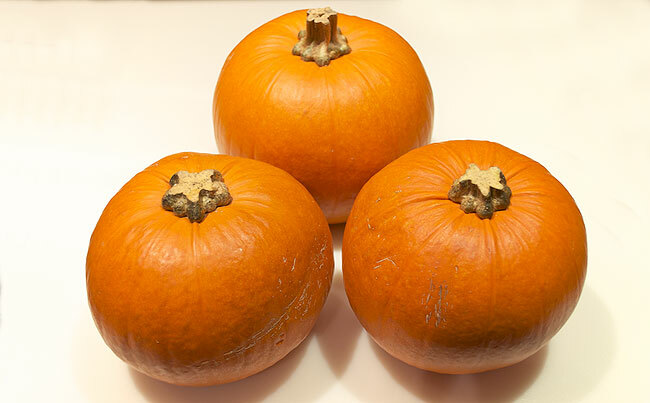 I prefer the small sweet pumpkins, however, there are many varieties of pumpkins suitable for eating. Use a peering knife to cut around the stem of the pumpkins and remove the stem. Use a sharp heavy knife cut the pumpkin(s) in half vertically. With a large metal, spoon remove the seeds from the halves. The seeds can be saved for roasting or discarded. Place the pumpkin halves face down on a sheet pan covered with foil. Cover the pumpkin halves with foil. 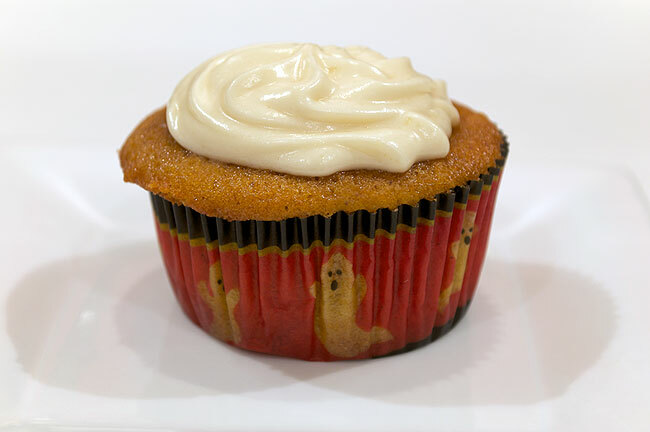 Bake at 350°F for 55-60 minutes, until the meat of the pumpkin halves are soft and tender. Allow to cool. Scoop the soft pumpkin into a bowl or blender, the skin will pull away easily, and puree. Portion and freeze for later use or refrigerate for use within the two to three days. I portion 15 ounces at a time, this is the standard volume of canned pumpkin used in most recipes. Frozen Pumpkin puree will last up to four months. Use a peering knife to cut around the stem of the pumpkin(s) and remove. Use a sharp heavy knife cut the pumpkin(s) in half vertically. With a large metal spoon remove the seeds from the halves. Place the pumpkin halves face down on a sheet pan covered with foil. Cover the pumpkin halves with foil. Bake at 350°F (177°C) for 55-60 minutes, until the meat of the pumpkin halves are soft and tender. Allow to cool. Scoop the soft pumpkin into a bowl or blender and puree. Portion and freeze for later use or refrigerate for use within the two to three days. Frozen Pumpkin puree will last up to four months. I’m combining the notes from the Bakeshop Skill Class for the first two weeks covering Chocolate, I’ll do the same for the next two weeks as well. Due to the weather, the class schedule has been changed slightly (it was 100°F yesterday so we could not temper chocolate, it was too hot). The two weeks were spent covering chocolate basics, including tasting and tempering and creating a few chocolate-based desserts. We started off the lecture by watching a short film on the history and process of chocolate making. Chocolate is produced from the seed of the Theobroma cacao tree. Cacao has been cultivated for at least three thousand years in South America. The majority of the Mesoamerican people made chocolate beverages. The seeds of the cacao tree have a bitter taste and must be fermented to develop the flavor. After fermentation, the beans are dried, cleaned, and roasted, and the shell is removed to produce cacao nibs. The nibs are then ground to cocoa mass, the longer it is ground the smoother it becomes. This process is called conching. At this point, the chocolate can be processed into cocoa solids and cocoa butter. When making decorations or candy out of chocolate the chocolate must first be tempered. This is done to ensure that the finished product is hard, snaps when broken shows no signs of bloom (cocoa mass that comes to the surface) and won’t melt on your fingers/hands. There is a lot of science involved in Chocolate, if your interested in reading more in-depth about it I recommend this article. Tempering is accomplished in three stages: melting, cooling and warming. It is vital that a probe thermometer is used as a candy thermometer will not work. When tempering remove from heat about 5°F bellow desired temperature because it continues to heat once removed from the heat source. Use a metal bowl because glass holds heat longer and takes longer to cool down. There are three main cooling methods. With the seed method, small pieces of room temperature chocolate are added to cool the chocolate to the desired temperature. The block method uses a solid mass of chocolate to accomplish this. The benefit is you do not have to remove multiple pieces of chocolate from the cooled chocolate if the desired temperature is reached before the multiple pieces melt. The third method is tabling or poring the heated chocolate on a marble slab. There are two main types of chocolate used in decorating and candy. Coverture is cocoa liquor, sugar, cocoa butter, vanilla, and emulsifier. Coating Chocolate is cocoa liquor, sugar, hydrogenated oil, vanilla, emulsifier. Coating Chocolate does not have to be tempered since because the hydrogenated oil solidifies. However, the flavor and mouthfeel will suffer. Real white chocolate is not white, it has a yellow cast/ivory color from the cocoa butter. Mexican Chocolate is coarse and grainy. It’s not conched very long and is therefore cheaper. It contains sugar, cinnamon, and cocoa. It’s all ground together with raw ingredients. Oaxacan Chocolate adds almonds to the chocolate. All varieties are made for cooking and drinking, not meant as eating chocolate. The final week of cakes in the Bakeshop Skills class. The majority of the lecture was focused on how to assemble and make Opera Cake. The cake makes a nice roundup of all the techniques and science we studied so far. We also covered decorating with Fondant and a molded mouse cake. Opera cake is a layer cake that consists of three layers of sponge that are soaked with coffee cake syrup, two layers of mocha buttercream, and a layer of chocolate ganache topped with a chocolate glaze. In order to assemble the cake we dealt with tempting the sheet cake on a cake board, the Swiss method of buttercream, how to make ganache and a glaze, and how to properly slice the cake. Techniques used in making the cake included folding, making nut flour, tempting on a sheet pan, and creaming. To make the buttercream the techniques covered were tempering of egg whites, making a meringue and the proper way to apply buttercream to a cake. We also learned how to apply fondant to a cake as well as how to create simple decorations using fondant. 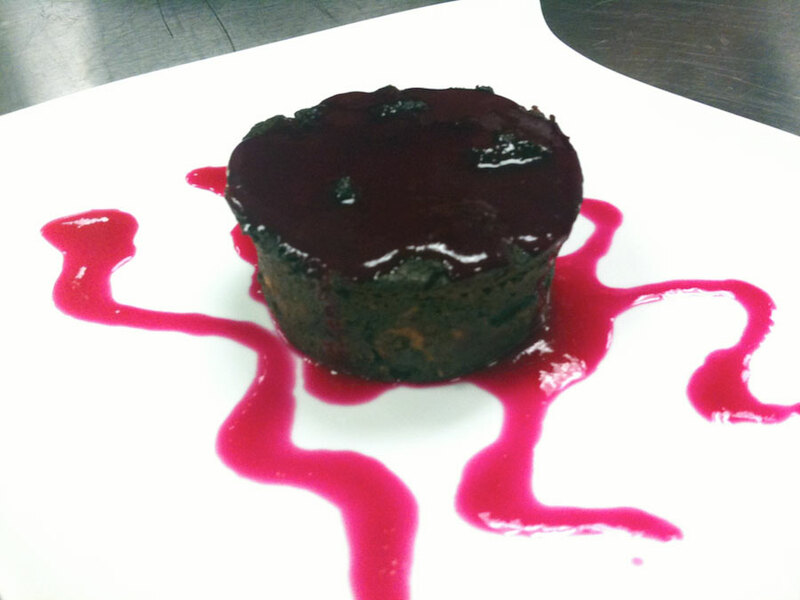 The fondant was prepared in class a few weeks back. We created a mousse layered cake using molds and a checkered cake base that used a template for the design.